After choosing which bird is right for your ad campaign (for instance penguins are best for the cold arctic regions and are limited in geo-location reach because penguins can’t fly, of course), you are instructed to write your marketing message for your bird’s beak, head, wings and tail feathers. Google then explains that your bird will fly in any existing targeted locations in your account. Migratory birds may only be available in certain regions depending on the time of year, or may completely fly out of your targeted region. 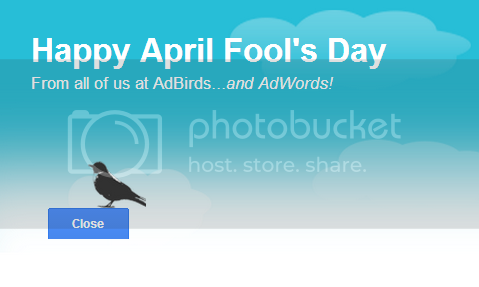 Write your copy and press “let it fly” to be reviewed by the Google Adbirds team, and see the friendly screen wishing you a happy April Fool’s Day from the Google Adwords team. This is a totally legit idea… http://www.birdflightmedia.com does this! What’s the cost per cluck?